This page was made especially for teachers and students of Japanese Buddhism. It presents everything on one page for easy printout, with links to the most relevant topics and reference notes for further study. Maroon Text. Jumps within this page or to another site page. Mandala is pronounced “mandara” in Japanese, and hereafter both spellings are used interchangeably. Sources. This page relies heavily on numerous sources, but especially on the online JAANUS database. This is a work in progress. Any mistakes or omissions are my responsibility. Please contact me when/if you find them. Mandala devoted to a single deity. Abundant in Japan. Betsubu Mandala 別部曼荼羅 or Bue Mandala 部会曼荼羅. Devoted to a specific family of deities. Quite rare in Japan. Miya Mandala 宮曼荼羅 and Sankei Mandala 参詣曼荼羅. 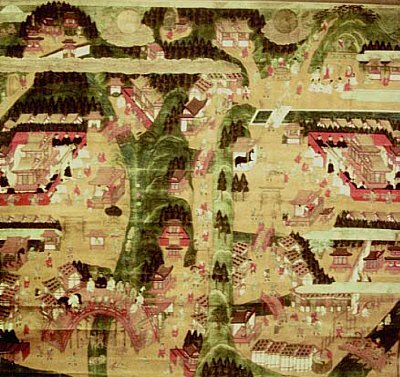 Devotional paintings of shrine and/or temple landscapes; a map-like illustration showing buildings, pathways, pilgrims, practioners, priests and nuns, deities, and other scenes. Once abundant, but only a relatively small number of pieces still extant. Tobu Mandala 都部曼荼羅 or Toe Mandala 都会曼荼羅. Mandala depicting myriad deities from numerous deity families. Abundant in Japan. The most widely known Toe-type mandala is the Ryōkai Mandala. Katsuma Mandala 羯磨曼荼羅. Deities represented by three-dimensional images. Shishu Mandala 四種曼荼羅 or Daimandara 大曼荼羅. Deities depicted in human form. Shuji Mandala 種字曼荼羅 or Hō Mandala 法曼荼羅. Deities represented by Sanskrit syllables. Maroon text = Jumps within this page or to other site page. In a larger grouping, there are actually 28 forms in Three Realms (Skt: Triloka). Before reaching Japan, the mandala traditions of India, China, and Tibet followed a three-family format – the Buddha, Lotus, and Vajra families. Around the 8th century, however, this was replaced by a five-family format. Aizen Mandala 愛染曼荼羅. Classified as a Besson Mandala, one featuring a single deity from the Myō-ō (Myo-o) Family, in this case Aizen Myō-ō 愛染明王. There are several variations. The Kamakura-era version kept at the Nezu 根津 Museum in Tokyo shows Aizen in the center, surrounded by 16 other deities. Sitting around Aizen are four Bodhisattva and their consorts (representing the four directions and four intermediate directions), while the outer enclosure is populated by the Four Guardian Bodhisattva (Shishō Bosatsu 四摂菩薩) and Four Offering Bodhisattva (Incense, Flower, Lamp, and Perfume). This differs drastically from another Kamakura-era Aizen Mandala kept at Taizanji Temple 太山寺 in Hyōgō prefecture. In this latter work, Aizen is surrounded by four other Myō-ō (Gōsanze 降三世明王, Gundari 軍荼利明王, Daiitoku 大威徳明王, and Kongōyasha 金剛夜叉明王) and four youthful attendants (Dōji 童子), while the outer section is populated by the Twelve Guardian Deities (Jūniten 十二天). Kongōbuji 金剛峯寺, Mt. Kōya 高野, Wakayama Pref. Aizen is the Honzon 本尊 (central deity) of the Japanese Keiaihō (Keiaiho) 敬愛法 esoteric rite of harmony & friendship. This rite is very popular in Japan. Akadōji 赤童子 (Akadoji, lit. Red Youth). A painting subject. See Kasuga Mandala. Amida Mandala 阿弥陀曼荼羅. See Jōdo Mandala and Jōdo Sanmandara. Devoted to Amida Nyorai and the Western Pure Land (Jōdo 浄土). 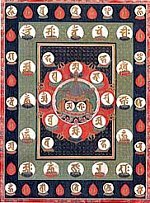 Anchin Mandala 安鎮曼荼羅. Classified as a Besson Mandala, one featuring a single deity from the Myō-ō Family, in this case Fudō Myō-ō (Fudo Myo-o) 不動明王. A mandala utilized in an esoteric rite called Anchinhō (Anchinho) 安鎮法, which aims at achieving peace and bringing security to the state. There are variations. In the Tendai 天台 sect, a yellow-colored Fudō appears at the center and is depicted with two arms. In the second enclosure, Fudō is surrounded by eight blue Fudō figures (each four-armed), with each seated inside an eight-spoked wheel. In the outer enclosure are the Guardians of the Eight Directions (Happōten八方天). The Shingon 真言 sect depicts a four-armed Fudō surrounded by the Guardians of the Eight Directions (or sometimes the Guardians of the Ten Directions = Jippōten 十方天). There are variations. 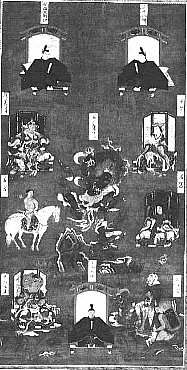 See photo at right, depicting Twelve Celestials surrounding Fudō. Benzaiten Mandala. See Tenkawa Benzaiten Mandala below. Besson Mandala 別尊曼荼羅. Mandala devoted to a single deity. Made in great number in Japan due to popularity of numerous esoteric rites dedicated to specific deities (Bessonhō 別尊法) and specific outcomes (e.g., peace, security, pacification, avoidance of evil, harmony in the home, enlightenment). One of four major mandala categories in Japan. It includes such mandala as the Aizen Mandala, Butsugen Mandala, Ichijikirin Mandala, and many others. Betsubu Mandala 別部曼荼羅. See Bue Mandala below. Bu 部. Japanese term meaning “division” or “family.” Esoteric deities are generally classified into one of the following families: Buddha Family (Butsu-bu 仏部), Buddha-Crown Family (Butchō-bu or Bucchō-bu 仏頂部), Sutra-Rite Family (Kyōbō-bu 経法部), Bodhisattva Family (Bosatsu-bu 菩薩部), Myō-ō Family (Myo-o-bu 明王部), Celestial Gods Family (Tentō-bu 天等部), and Others (e.g., star deities). For details on deity families in Japan’s popular Two-World Mandala, or Ryōkai Mandala, see Kongōkai Family and Taizōkai Family. Bue Mandala 部会曼荼羅. Also called Betsubu Mandara 別部曼荼羅. Mandala devoted to deities in a single family. Relatively rare in Japan. One of four major mandala categories in Japan. Butchō or Buccho 仏頂 (Butcho, Buccho) Also known as Butchōson 仏頂尊 (Butchoson, Bucchōson, Bucchoson). Literally Buddha Crown. See Daibutchō Mandala for details. Butsugen Butsumo 仏眼仏母. See Butsugen Mandala below. Dai Mandala 大曼荼羅. Also Daimandala. Literally “Great Mandala.” Classified as a Shishu Mandala, one of four basic artistic/stylistic mandala cateogories, one depicting the deities in physical (human) form. A variant is used by the Nichiren 日蓮 sect. See Hokke Mandala for details. 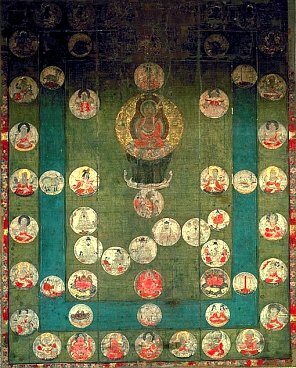 Daibutchō Mandala 大仏頂曼荼羅, or Daibutcho Mandala. Other spelling include Dai Bucchō or Daibuccho. Depicts the Nine Butchō (Kubutchō 九仏頂), with eight encircling Dai Butchō 大仏頂 or Shōissai Butchō 摂一切仏頂. The term Butchō, Butcho, or Butchōson 仏頂尊 literally means "Buddha Crown." It refers to a class of Esoteric deities who personify the bump of knowledge (Skt. = Usnisa) atop the Buddha’s head; the Butchō embody the power of the light emitted from that bump; they often appear as Bodhisattva, and can assume male or female form; in Japan, the Butchō are associated especially with rites for the dead, for their powers include purifying evil karma and liberating people from hell. There are different groupings of three, five, eight, nine, and ten Butchō; they sometimes appear in the Shaka-in 釈迦院 section of the Taizōkai Mandala and in the Sonshō Mandala. Eight Butchō (Hachibucchō, Hachibutcho, 八仏頂). Three Butchō and Five Butchō; the eight sometimes appear in the Shaka-in 釈迦院 section of the Taizōkai Mandala and in the Sonshō Mandala. Nine Butchō (Kubucchō, Kobutcho, 九仏頂). Eight Butchō encircling Dai Butchou 大仏頂 or Shōissai Butchō 摂一切仏頂. See Daibutchō Mandala. Daibutchō Tsūyō Mandala 大仏頂通用曼荼羅. A type of a Besson Mandala introduced from China to Japan in 805 by Saichō 最澄 (766-822), the founder of the Tendai 天台 sect. 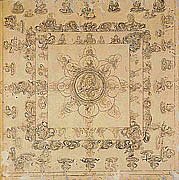 Daihitaizō Sanmaya Mandala 大悲胎蔵三昧耶曼荼羅. Brought from China to Japan by Ennin 円仁 (794-864); a line drawing (no longer extant) closely related to the Taizō Zuzō; a copy dated to 1019 and now preserved at Daigoji Temple 醍醐寺 in Kyōto is considered the oldest extant Japanese copy of such line drawings. Dakiniten Mandala 荼吉尼天曼荼羅. From the Heian period onward, Dakiniten was invoked in various esoteric rites in Japan to gain complete mastery in human affairs, to hex one's enemies, to win favor at court, to pray for good fortune, and other matters. In Hindu mythology, the Dakini are a class of wrathful female demons who drink blood and eat human flesh, and scholars consider them acolytes of the Hindu goddess Kali. Over time the Dakini were incorporated into Vajrayana (Tantric) traditions as lower-ranking goddesses. In Japan, however, the Dakini group never gained a large following, except for one named Dakiniten (also spelled Dakini-ten). In Japan, Dakiniten is typically depicted riding a fox (often white) and closely associated with food and the rice crop. She is thus, in Japan, often associated or merged with the Shinto rice god Inari (whose messenger is the fox). She also assumes forms related to Daikokuten (lord of five grains). In the 8th-century text Dainichikyousho 大日経疏, Dainichi Buddha appears as Daikokuten in order to subdue Dakiniten 荼吉尼天. She is also closely associated with the esoteric form of the Buddhist goddess Benzaiten. See Tenkawa Benzaiten for more details on Dakiniten. Lit. "Mandala of Three Deva"
Various syncretic themes are blended in this mandala, including the Oinari 稲荷信 connection (Shintō) with foxes and the Hindu and Buddhist connections with Dakiniten, Kangiten, and Benzaiten. In addition, the museum says a "Black Book" from Hieizan's Myoutoku-in (比叡山明徳院) was found at the back of the mandala, giving it the name 三天合形曼荼羅 (Mandala of Three Deva), and indicating probable Shugendō influence. Most of the figures along the border are “probably” the Jūgo Dōji 十五童子 (Fifteen Sons or Disciples of Benzaiten). See Tenkawa Benzaiten below. Dengyō Daishi 伝教大師 (767 - 822 AD). Also spelled Dengyo Daishi. Literally “Great Master Who Transmitted the Teachings.” It is the posthumous name for Saichō 最澄, the founder of Japan’s Tendai 天台 sect of Esoteric Buddhism (Jp. = Mikkyō 密教). Despite his many contributions, the flowering of mandala artwork in Japan is generally credited to Kūkai (aka Kōbō Daishi) and Shingon traditions. For more details on Saichō, see Tendai Sect below. Denshingon-in Mandala 伝真言院曼荼羅 at Tōji Temple 東寺 in Kyoto. A famous example of the Ryōkai Mandala; a designated national treasure. Dōjikyō (Dojikyo) Mandara 童子経曼荼羅. 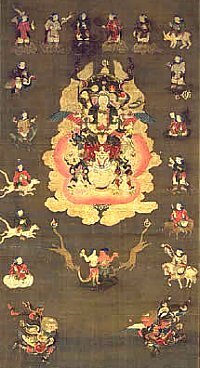 The central figure of the Dōjikyō Mandala 童子経曼荼羅 is Sendan Kendatsuba, who is a guardian of children, one who expels demons of plague, and a king of the Kendatsuba (a class of semi-divine beings who protect Buddhism). The Dōjikyō Mandara was used in esoteric rituals to ward off demons and protect children from illness and danger. Engi Mandala 縁起曼荼羅. Painting that illustrates the story of a Shintō shrine’s foundation. and at Freer Gallery of Art in the US. Fushū-e (Fushu-e) Mandala 普集会曼荼羅. 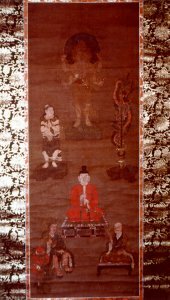 A type of Toe Mandala showing various deities from numerous deity families; described in the Darani Jikkyō 陀羅尼集経 (Taishō No. 901). Genzu Mandala 現図曼荼羅. A version of the Taizōkai Mandala 胎蔵界曼荼羅 (Womb World, Matrix Mandala) still widely used and replicated by Japan's Shingon 真言 and Tendai 天台 sects. It was brought to Japan from China by Kūkai 空海 (Kukai; 774-835), who studied under the Chinese Master Huiguo 恵果 (Jp. = Keika; 746-805). Huiguo is credited with the finalized Genzu format, which stemmed from descriptions of the Taizōkai Mandala in the Dainichikyō Sutra 大日経 (Skt. = Vairocanabhisambodhi-sutra / Mahavairocana-sutra). 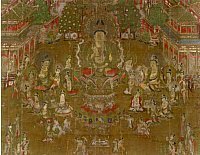 Although the Genzu format can vary somewhat, it generally includes around 414 deities arranged systematically into 12 sections. That is a massive increase from the approximately 120 deities mentioned in the Dainichikyō Sutra, the 242 deities appearing in the Taizō Kyūzuyō, and the 324 deities appearing in the Taizō Zuzō. The latter two predate the Genzu Mandara, which is thought to have evolved from them. The Genzu format is typically divided into 12 sections that depict specific deities and deity families. See Quick Quide for Listing of All Twelve. Gobu Shinkan 五部心観. Extant hand-scroll line drawings depicting the deities of the Kongōkai (Diamond) Mandala, but in a format that differs from the orthodox Kongōkai layout; brought to Japan by Enchin 円珍 (814-91); it's full title is Ritasōgyara Gobu Shinkan 哩多僧蘖五部心観; the original is kept at Onjōji Temple 園城寺 in Shiga Preference. Gohonzon 御本尊. Also spelled Go-Honzon. A mandala used by the Nichiren sect and based on the Lotus Sutra. See Hoke Mandala for details. Hachiji Monju Mandala 八字文殊曼荼羅. Eight-Letter Monju Mandala. Classified as a Besson Mandala, one featuring the "Bodhisattva Family," for the central deity in this case is a form of Monju Bodhisattva. See photo above at right. 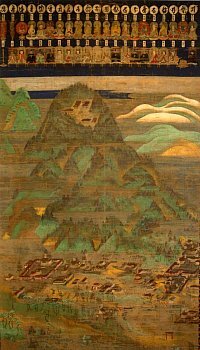 Three peaks of Hakusan and their mountain avatars typically appear in such paintings, as does Taichō 泰澄 (d. 8th c), founder of the Hakusan cult. and Hakusan Shichi Gongen 白山七権現. Classified as a type of Miya Mandala. Hakusan was a sacred mountain site from early times, a center of syncretic Shinto-Buddhist beliefs and the Shugendō 修験道 cult of mountain worship. It is located along the borders of four prefectures (Fukui, Gifu, Ishikawa, and Toyama). From the 12th century onward, it was ruled by Enryakuji Temple 延暦寺 on Mt. Hiei 比叡 in Kyoto Prefecture, and thus copied the 21-shrine format (7-7-7 pattern) of the Sannō 山王 shrines at Mt. Hiei (see Hiei Mandala). The main deity is Shirayama-hime 白山比売 and her shrine-temple is known as Hakusan Hongū 白山本宮 (or Hakusanji 白山寺). Her group of seven shrines is the main group, and its seven deities are called the Hakusan Shichi Gongen 白山七権現 (Seven Avatars of Mt. Hakusan). There is another grouping of three called the Hakusan Sansho Gongen 白山三所権現, and they are thought to represent the three deities of the three mountains Bessan 別山, Gozenpō 御前峰, and Oonanjimine 大汝峰. The Buddhist counterparts (honjibutsu 本地仏) of the three are sometimes given as Shō Kannon 聖観音, Jūichimen Kannon 十一面観音 and Amida 阿弥陀, but this can vary depending on the source. For many more details on sacred Mt. Hakusan, please see our Hakusan Mountains & Deities Page. For more on the Hakusan Mandala, please see JAANUS. Hannya Bosatsu Mandala 般若菩薩曼荼羅. This is the abbreviated name for Hannya Haramitsu 般若波羅蜜 or Hannya Haramitta 般若波羅蜜多, a female bodhisattva of India providence who personifies the Hannya Haramitsu (Skt. = Prajna Paramita). This latter Sanskrit term refers to the process of “perfecting wisdom.” By extension, it refers to the Mahayana sutra known as the Hannyakyō 般若経 (Skt. = Prajnaparamita Sutra), which describes a six-fold path for overcoming delusion, perfecting wisdom, and achieving enlightenment. In this sense, “wisdom” equates with “enlightenment,” and thus this female deity is also called Butsumo 仏母 (literally “Mother of the Buddha;” also see Butsugen Mandala. 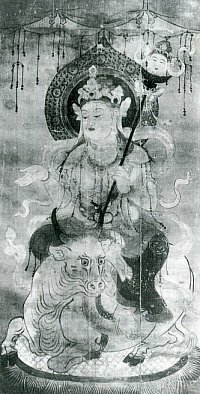 She is depicted in various forms, but most commonly shown holding her namesake sutra. In Japan she is sometimes invoked instead of Shaka 釈迦 (the Historical Buddha) during the Daihannya-e 大般若会, a ritual reading of the 600-fascicle translation of her sutra, and one that included veneration of the Hannya Mandara, in which she is typically shown alone or surrounded by the 16 Good Deities (Jūroku Zenjin 十六善神). The latter are said to protect people who recite her sutra. In Japan, Hannya Bosatsu is rarely represented at the center of a mandala. Hie Sannō Mandala (Hie Sanno) 日吉山王曼荼羅. Devotional paintings from the shrine-temple Tendai 天台 multiplex known as Hie Sannōsha 日吉山王社 (also called Hiyoshi Sannōsha) located at Mt. Hiei 比叡 in Sakamoto 坂本, Shiga Prefecture. When Monk Saichō 最澄 (Saicho, 766-822) returned from his studies in China, he gave the local Shintō deity Ōyamagui 大山咋 the name Sannō; the name is thought to derive from the Chinese god who protects China's Mount Tientai 天台 (Jp. = Tendai). In Japan, Sannō 山王 (lit. Mountain King) takes the form of a monkey avatar known as Sannō Gongen 山王権現. Extant paintings date from the middle 13th century. There are related paintings known as Hie Sannō Matsuri 日吉山王祭 or Sannō Matsuri 山王祭, which illustrate the Hie Shrine’s annual festival devoted to the monkey avatar. The Hie shrine-temple multiplex is one of the three most important syncretic Shintō-Buddhist sites in Japan, along with the Kumano 熊野 complex in southern Wakayama Prefecture (see Kumano Mandala) and the Kasuga 春日 shrines near Nara (see Kasuga Mandala). The Hie shrine-temple multiplex was already an important center of Shinto-Buddhist syncretism in Japan in the mid-Heian period, when it became a popular site among nobles and commoners alike. Its central deity is SANNŌ, whose messenger (tsukai 使い) and avatar (権現) is the monkey. The Sannō deity is broadly conceived, for Sannō actually represents three Buddha (Shaka, Yakushi, and Amida), who in turn represent the three most important Shintō KAMI (deities) of the Hie complex (Omiya 大宮, Ninomiya 二宮, and Shōshinshi 聖真子). All six are considered manifestations of the Sannō deity. By the Kamakura period, the multiplex was composed of 21 shrines (Sannō Nijūissha 山王二十一社), which were associated with 21 Sannō deities, which in turn were associated with 21 specific Buddhist counterparts. The many manifestations of the Sannō deity are called "Hie Sannō Gongen" (日吉山王権現 Mountain King Avatars of Hie Shrine). The 21 shrines are split into three groups of seven -- the three groupings represent the three main Buddha-Kami pairings of the Tendai complex. The so-called Upper Seven Sannō Shrines (Sannō Kami no Shichisha 山王上七社) form the core of the Sannō complex. Known as the Big Hiei group, they are associated with Shaka and with the seven stars of the Big Dipper. The next group of seven shrines, known as The Little Hiei group, is associated with Yakushi Nyorai. The Hiyoshi Sannō Mandala 日吉山王曼荼羅 at Reiunji Temple 霊雲寺 in Tokyo (a designated national treasure dated to the Kamakura period) depicts the landscape, structures, and syncretic deities of the 21 shrines at Mt. Hiei, and shows a monkey as well. As such, it can be considered a type of Suijaku Mandala. However, says scholar MASUTO TOYOOKA, the mandala was long misidentified as a Yoshino Mandala (see photo in Yoshino Mandala section). However, its close resemblance to another extant painting of the Hiyoshi-Sannō deities (at Kudaraji Temple 百済寺 in Shiga 滋賀 Prefecture) helped convince scholars of its mistaken designation. Himitsu Mandala 秘密曼荼羅. Secret Mandara. See Sanmaya (Samaya) Mandala. Hiyoshi Sannō Mandala (Hiyoshi Sannosha) 日吉山王社. See Hie Sannō Mandala. Hō (Ho, Hou) Mandala 法曼荼羅. See Shuji Mandala. Says Gabi: This Hoki Bosatsu has six arms and five eyes. He stands on a rock with a wrathful face. This is possibly the only painting of the deity. Perhaps painted by Tayuu Hoogen Saiken in the 15th century. This painting is an important cultural property of Sakai Town, Osaka. Hōki (also spelled Hoki, Houki) is a relatively unknown Japanese bodhisattva. The characters for Hōki 法起 are exactly the same as the characters of Hōkiji Temple 法起寺 (reportedly established by Shōtoku Taishi’s son in the foothills northeast of Hōryūji Temple in Nara in the early 7th century). Hōki could be loosely translated as "arising dharma" or "awakening knowledge." A secret image 秘佛 of this deity is found at Bodaiji Temple 菩提寺 in nearby Hyōgo Prefecture. Says site contributor Gabi Greve: "This Bosatsu is not very familiar, but he is one of the protector deities of mountain ascetics, ranging back to the time of En no Gyōja 役行者, the latter the most famous Japanese mountain holy man of the 7th century. Hōki Bosatsu is sometimes depicted with five eyes and six arms 五眼六臂. He is also considered an incarnation of Hōdō Sennin 法道仙人, an Indian ascetic who, according to well-known legends, lived in the 7th century during the time of Emperor Suiko and Shōtoku, and walked all the way through China and Korea until he reached Japan. He walked with his companion, the God of the Bulls, Gozu Tenō 牛頭天王. Hōdō Sennin is very popular in the area around Himeji in Hyōgo Prefecture, which is also an area with strong connections to Shōtoku legends. Hōdō Sennin is said to have founded BodaiJi Templeand a few others in this region." <end Gabi Greve quote> The link between Hōkiji Temple and Hōki Bosatsu is unknown, but Hōki Bosatsu is clearly an esoteric deity, and Hōkiji Temple was affiliated with the Shingon sect of esoteric Buddhism for a short time. Also, Shōtoku maintained many associations with the Shinto cults of his day, and it is an least plausible that Hōkiji Temple may be in some way associated with Japan's early mountain cults. Mt. Kōya 高野, Wakayama Pref. (Historic Buddha) and Tahō 多宝如来 (related to the future) are seated in a jeweled pagoda. Click images above for larger image. 13th Century, Kousetsu Art Museum. Both are Important Cultural Properties. Lotus Mandala. Also called Hokkekyō Mandala 法華経曼荼羅, Hokekyō Hōtō Mandala 法華経宝塔曼荼羅, and Hokkekyō Hensō 法華経変相. 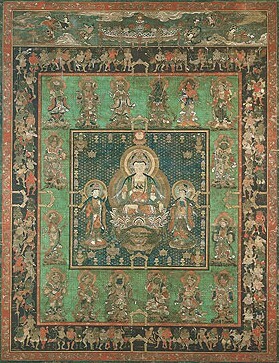 A class of Besson Mandala that features the “Sutra-Rite Family” of Deities. The Hokke Mandara comes in various flavors. For example, a common format depicts a great assembly of disciples, Bodhisattva, divine beings, and celestial creatures who have gathered to hear the Buddha expound the teachings of the Lotus Sutra. Another format is a pictorial illustration of these teachings, more properly called the Hokkekyō Mandala (Lotus Sutra Mandala). In Japan’s Esoteric sects, the Hokke Mandala serves as an object of veneration in Lotus Sutra Rites (Hokkekyō-Hō 法華経法). Honkyōji Temple 本境寺, Fukui Pref. attributed to Nichiren 日蓮 (1222-82). Hokuto Mandala 北斗曼荼羅. Big Dipper Mandala. Used when performing the Hokutohō 北斗法 or "Big Dipper Rite" for averting natural disasters and calamity. Classified as a type of Hoshi (Star) Mandala. Also classified as a Besson Mandala dedicated to specific deities. This mandara’s most popular appearance in Japan is centered around Shaka Kinrin 釈迦金輪 (Gold Wheel Shaka). Shaka Kinrin is a manifestation of Shaka Buddha 釈迦如来 (the Historical Buddha), one in which Shaka is holding a golden wheel in his hands, with the latter placed on the lap and the hands forming the Hokkai Jōin Mudra 法界定印 (dharma-realm meditation mudra). Ichijikinrin Butchō (see Ichijikinrin Mandala) can sometimes assume the form of Shaka Kinrin 釈迦金輪. In the Hokuto Mandara, Shaka Kinrin is often shown surrounded by the Big Dipper’s seven stars, by the nine planets, by the 12 signs of the Zodiac, and by the deities of the 28 lunar mansions. The Tendai 天台 sect uses a circular mandara (a renowned example is preserved at Hōryūji Temple 法隆寺 in Nara, while the Shingon 真言 Sect uses a square mandara (preserved at Kumedadera 久米田寺 in Osaka). See photos of both below. The disposition of the deities varies somewhat. See also Tōhon Hokuto Mandala, which is devoted to Shijōkō Butchō 熾盛光仏頂. Ichijikinrin Butchō 一字金輪仏頂 at center. Says the Kyoto National Museum: Under the central Buddha are seven medallions shaped like an "S" turned on its side, or a scoop. Inside each medallion is a figure wearing a headdress. These are the Seven Stars of the Big Dipper, the most important stars in the Star Mandala. They are shaped like this to represent the constellation of the big dipper. Other medallions in the center section represent planets such as Mercury, Venus and Saturn, and the Sun and Moon. Honjaku Mandala 本迹曼荼羅 (shows Shinto & Buddhist deities in relation to one another). See Kasuga Mandala. Honji Mandala 本地曼荼羅.See Kasuga Mandala or Suijaku Mandala. Honjibutsu Mandala 本地仏曼荼羅 (shows only the Buddhist deities). See Kasuga Mandala. Honji Suijaku Mandala 本地垂迹曼荼羅. Mandala of True and Manifest Deities. Also known as the Songyō Mandala. See Kasuga Mandala for a few more details. Hōrōkaku (Horokaku) Mandala 宝楼閣曼荼羅. Based on the Jeweled Pavilion Sutra 宝楼閣経 of Indian providence, hence the name. 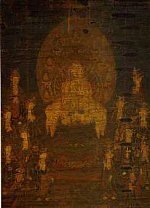 There are considerable discrepancies among surviving copies, but generally the mandala depicts a pavilion wherein Shaka Buddha 釈迦如来 (the Historical Buddha) is seated. On his right is the four-faced, twelve-armed Kongōshu Bodhisattva 金剛手 (Kongoshu, Skt. = Vajrapani). On the left is the four-faced, sixteen-armed Hōkongō Bodhisattva 宝金剛 (Hokongo, Skt. = Manivajra). Around them are the Four Heavenly Kings (Shitennō, Shitenno, 四天王) and other protective deities. Hokuto Mandala. Centered around Shaka Kinrin 釈迦金輪 (Gold Wheel Shaka), a manifestation of Shaka Buddha 釈迦如来 (the Historical Buddha); also known as the Big Dipper Mandala. Kara-zu 火羅図. Star drawings that resemble a horoscope. Myōken Mandala 妙見曼荼羅; centered on Myōken (Myoken) Bodhisattva, a deification of the pole star. Shichishō Nyoirin Mandala 七星如意輪曼荼羅; literally Seven-Star Nyoirin Mandala (other spellings: Shichisho, Shichishou); devoted to Nyoirin Kannon 如意輪観音; see Nyoirin Mandala for more details. Shūnanzan Mandala 終南山曼荼羅; reflects Taoist influences. Tōhon Hokuto Mandala 唐本北斗曼荼羅; of Chinese origin and devoted to Shijōkō Butchō (Shijoko Butcho) 熾盛光仏頂. Center = Ichijikinrin Butchō ?? Also spelled Ichiji Kinrin. A type of Besson Mandala, but one featuring the Buddha-Crown Family (Butsubu 仏部) and centered on the deity Ichijikinrin Butchō 一字金輪 (One-Syllable Gold Wheel). Ichijikinrin is also known as Ichijikonrin, Kinrin Butchō 金輪仏頂 (Gold-Wheel Buddha Crown), Kidoku Butchō 奇特仏頂 (Marvellous Buddha Crown), or Ichijichōrin-ō 一字頂輪王 (Wheel King of the One-Syllable Crown; Skt. = Ekasarosnisa Cakravartin). Ichijikinrin personifies the single-syllable Sanskrit term “bhrum” (Jp. = Boron 勃ろん). This holy word is said to embody the virtues of all Buddha and Bodhisattva. Ichijikinrin is considered supreme among the Butchō (see Daibutchō Mandala for more details on Butchō deities). Kinrin 金輪 means Gold Wheel. It is one of the seven treasures, the most important of the four wheels of motion, and a sign of the universal ruler, or "Wheel King" (Rinō 輪王 or Tenrinjō-ō 転輪聖王; Skt. = Cakravartin). In the Ichijikinrin Mandala, Ichijikinrin is shown in the center with hands in the Chiken-in Mudra 智拳印 (knowledge-fist mudra). Although extant examples differ, Ichijikinrin is generally surrounded by seven treasures (Shippō七宝, Skt. = Saptaratna), which in the Sino-Japanese tradition are considered marks of the universal ruler. Butsugen Butsumo 仏眼仏母 sometimes appears in extant mandala of this type. Ichijikinrin appears in two main forms. As Dainichi Kinrin 大日金輪 (as in the Ichijikinrin Mandala), he is similar in appearance to Dainichi Buddha 大日如来. His hands form the wisdom-fist mudra and he is typically shown sitting within a solar disc. In the Hokuto Mandala (Big Dipper Mandala), however, he assumes the form of Shaka Kinrin 釈迦金輪. Jikkai Mandala 十界曼荼羅. Ten Realms Mandala. Attributed to Nichiren日蓮. See Hokke Mandala for details. Jōdo Mandala 浄土曼荼羅 (Jodo Mandala; also known as Jōdo Hensō-zu 浄土変相図). 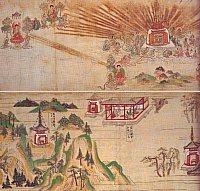 Paintings depicting the paradises and non-Trantric deities of Japan's Pure Land sects (浄土宗). The most popular pure land in Japanese Buddhism is associated with Amida Nyorai 阿弥陀如来and Amida's Western Paradise (Jp. = Saihō Jōdo 西方浄土; also called Amida Jōdo Hensō 阿弥陀浄土変相, Gokuraku極楽, Skt. 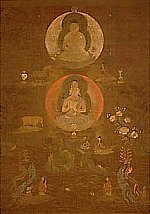 = Sukhavati). However, the pure lands of Mahayana Buddhism also include those of Yakushi Buddha 薬師, Shaka Buddha 釈迦, and Miroku Bodhisattva 弥勒. Kannon Bodhisattva 観音is often included in Pure Land paintings associated with Amida’s Pure Land. There are numerous variations on the Jōdo Mandara, but generally speaking, Amida in shown in the center and is flanked on both sides by attendants, usually Seishi Bodhisattva and Kannon. 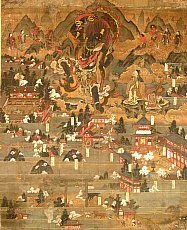 In addition, Amida artwork often depicts Amida surrounded by 25 Bodhisattva (including Kannon and Seishi) descending from heaven to guide departed souls back to paradise. Finally, mandala devoted to Amida’s Pure Land are often designated with a special writing convention for the term “mandala.” Instead of the typical 曼荼羅 characters, the term is written as 曼陀羅 – the middle kanji, 陀, is the same as the last character in Amida’s 阿弥陀 name. Jūuniten (Jyuniten) Mandala 十二天曼荼羅図. Mandala of The Twelve Celestials. At Kongōbuji Temple 金剛峯寺 (Mt. Kōya 高野 in Wakayama Prefecture). 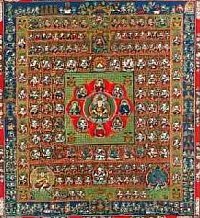 Also see Anchin Mandala for another photo depicting the Twelve Celestials. Kanjō Jikkai Mandala 勧請十界曼荼羅. Kanjojikkai Mandara. Mandala for Invoking the Ten Realms. Devised by Nichiren日蓮 (1222-82), the founder of Japan’s popular Nichiren sect. Also written Jikkai Kanjō Mandala 十界勧請曼荼羅. See Hokke Mandala for details. Kara-zu 火羅図. A type of Hoshi (Star) Mandala that resembles a horoscope. See photo at right. Kashimadachi Mandala 鹿嶋立曼荼羅or Kashimadachi Shen'ei-zu鹿嶋立神影図. See Kasuga Mandala. Kasuga Fudarakusen Mandala 春日補陀落山曼荼羅. See Kasuga Mandala. Kasuga Jōdo (Jodo) Mandala 春日浄土曼荼羅. See Kasuga Mandala. No source or date given. Katsuma Mandala 羯磨曼荼羅. Deities represented by three-dimensional images. One of four basic artistic/stylistic mandala cateogories. See also Shuji Mandala (Sanskrit syllables), Sanmaya Mandala (symbolic objects), and Shishu Mandala (human form). Kichijōten (Kisshōten) Mandala 吉祥天曼荼羅. A type of Besson Mandala devoted to the Celestial Gods Family, in this case to the deity known as Kichijōten (Kichijoten). Also read Kisshōten (Kisshoten). 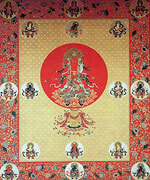 This goddess is depicted in the center of the mandala, flanked on the left and right by Bonten 梵天 and Taishakuten 帝釈天. A six-tusked white elephant is also typically shown. Kōbō Daishi 弘法大師 (774 - 835 AD). Also spelled Kobo Daishi. Literally “Great Master Kōbō” or “Great Master Who Spread the Teachings.” It is the posthumous name for Kūkai, the founder of Japan's Shingon 真言 sect of Esoteric Buddhism (Jp. = Mikkyō 密教). The flowering of mandala artwork in Japan is generally credited to Kūkai (aka Kōbō Daishi) and Shingon traditions. See Shingon for details. Kōdaigedatsu Dai Mandala 広大解脱大曼荼羅. 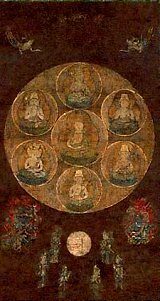 A type of Toe Mandala showing various deities from numerous deity families; described in the Fukūkenjaku Jinpen Shingonkyō 不空羂索神変真言経 (Taishō No. 1092). Kōfukuji Mandala 興福寺曼荼羅. Also Kofukuji Mandala. See Kasuga Mandala for details and photo. Kojima Mandala 子島曼荼羅. A designated national treasure. Also read Koshima Mandara. Famous pair of the mandala of the two realms (Ryōkai Mandala), originally kept at Kojimadera Temple 子島寺 in Nara but now located at the Nara National Museum. Also known as Tobi Mandala 飛曼荼羅 or Hikō Mandara 飛行曼荼羅 (both meaning "flying mandara"). Kongōkai Mandala 金剛界曼荼羅. Also Kongokai Mandara. Rendered in English as the Diamond World Mandala or Adamantine World Mandala. Centered on Dainichi Buddha大日如来. It is one of the most popular mandala forms among Japan's Esoteric sects. Paired with the Taizōkai Mandala, it is known as the Ryōkai Mandala (or Mandala of the Two Realms/Worlds). Both are typically hung in the halls of Esoteric temples, one on the east side and the other on the west. The Kongōkai Mandala was first described in the Kongōchōkyō 金剛頂経 (Diamond Peak Sutra; Skt. = Sarvatathagatatattvasa mgraha). 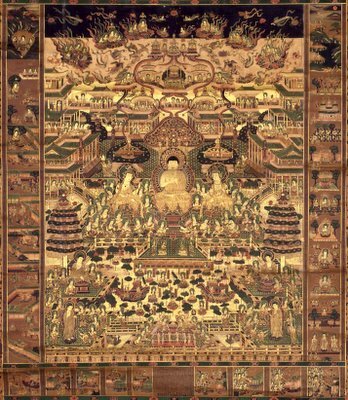 In Japan, it is also known as the Wisdom Mandala (Chi Mandara 智曼荼羅), the Mandala of Result (Ka Mandara 果曼荼羅), and the Great Mandala of the Adamantine Realm (Kongōkai Daimandara 金剛界大曼荼羅). It is commonly composed of 37 deities (see Kongōkai Sanjūshichison). Kongōkai Hachijūisson Mandala 金剛界八十一尊曼荼羅. 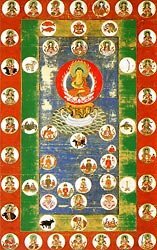 81 Deities Mandala of the Adamantine Realm. This mandala corresponds to the central assembly (Jyōshin-e 成身会) of the Kue Mandala, but with variations, namely all the deities appear as Bodhisattva; brought from China to Japan by Ennin 円仁 (794-864); used primarily in the Taimitsu 台密 branch of the Tendai 天台 sect and less so by the Shingon 真言 sect. Kongō Himitsu Mandala 金剛秘密曼荼羅. Also Kongo Himitsu Mandala. Lit. = Adamantine Secret Mandara. See Sanmaya Mandala. Kongōkai Sanjūshichison 金剛界三十七尊. Also Kongokai Sanjushichison. 37 Deities Mandala of the Adamantine Realm. 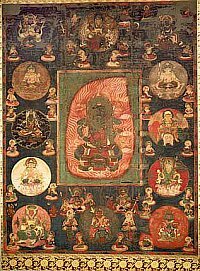 Centered around Dainichi Nyorai 大日如来 and composed of the Five Gochi Nyorai 五智如来, 16 Great Bodhisattvas (Jūroku Daibosatsu 十六大菩薩), Four Paramita Bodhisattva (Shiharamitsu Bosatsu 四波羅蜜菩薩), Eight Offering Bodhisattva (Hachikuyō Bosatsu 八供養菩薩), and Four Guardian Bodhisattva (Shishō Bosatsu 四摂菩薩). These 37 deities are classified into five families: (1) Nyorai-bu 如来部, Buddha Realm, Skt. = Tathagata-kula; (2) Kongōbu 金剛部, Adamantine Realm, Skt. = Vajra-kula; (3) Hōbu 宝部, Jewel Realm, Skt. = Ratna-kula; (4) Rengebu 蓮華部, Lotus Realm, Skt. = Padma-kula; and (5) Katsumabu 羯磨部, Action Realm, Skt. = Karma-kula. 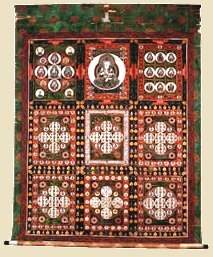 The Tathagata family is positioned in the center, with the other four placed in the four compass quarters, thus creating perfect symmetry both horizontally and vertically. This format has gained great popularity in Japan. Kongōkai Sanjūshichison Mandala Zuzō 金剛界三十七尊曼荼羅図像. Mandala of the 37 Deites of the Diamond World. Brought to Japan by Saichō 最澄 (766-822); kept originally at Shōren'in Temple 青蓮院 in Kyoto, but now at the Metropolitan Museum of Art in New York; differs somewhat from orthodox Kongōkai layout. Kongōyasha Mandala 金剛夜叉曼荼羅. Kongoyasha Mandala, also written 金剛薬叉明王. Corresponds to Kongōyasha Myō-ō 金剛夜叉明王 (Kongoyasha Myo-o, Skt. = Vajrayaksa), who is also considered one of the 16 Great Bodhisattvas (Jūroku Daibosatsu 十六大菩薩) of the Kongōkai Mandala and also one of the Five Great Myō-ō (Godai Myō-ō五大明王), the fierce gods who preside over the five directions (center and four compass points). Among Shingon sects, he represents the wrathful manifestation of Fukūjōju (Fukujoju) 不空成就, one of the Five Buddha of the Diamond Realm, he who commands the northern quarter. In the Tendai 天台 sect, his position is assumed by a different deity named Ususama Myō-ō 烏枢沙摩明王. His rite was carried out to to gain the love and respect of others and to subdue demons and enemies. However, Kongōyasha never gained a following in Japan, and extant artwork of this mandala remains rare. Konpon Mandala 根本曼荼羅. Literally "Root Mandala." The name given to the first images of the two mandala (Ryokai Mandala) brought back from China to Japan by Priest Kūkai (774 - 835 AD). The Shingon mandala lineage based on these "root" mandala is known as the "Genzu" or "original image" mandala. See Genzu Mandala. Koshima Mandala. See Kojima Mandala above. Kōya Mandala. Also spelled Koya Mandala. Mt. Kōya is home to the Shingon sect, which was founded by Kūkai 空海 (774 - 835 AD) in the 9th century. The main monastery at Mt. Kōya is Kongōbuji Temple 金剛峯寺 (Wakayama Prefecture). The mummified body of its founder (known posthumously as Kōbō Daishi 弘法大師) still lies there. Today the Mt. Kōya complex remains one of Japan’s most popular pilgrimedge sites. Kūkai and the Japanesese Shingon sect are credited, more than any other religious tradition, with introducing and propagating the mandala artform in Japan. The Mt. Kōya complex of shrine-temples houses a voluminous collection of mandala from the 9th century onward. Many of these are included here, on this web page. 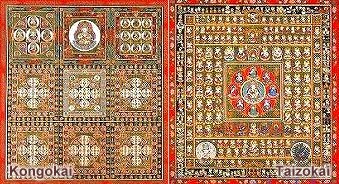 They include numerous Besson Mandala and mandala in the “Sutra Rite” family. Mandala associated with this important monestary and complex sometimes show sixteen peaks depicted as eight inner and eight outer petals, said to represent the Taizōkai Mandala and Kongōkai Mandala respectively. Below we discuss two categories of Kōya paintings. 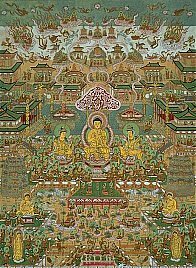 These paintings and scrolls are not generally considered MANDALA, but their widespread use can be broadly classified as a type of mandala. See Kōya Shijyō Myōjin below. Also written Koya Shijyo Myojin. Literally "Four Deities of Mt. Kōya." All four are commonly depicted in scrolls and paintings associated with the Shingon complex at Mt. Kōya (Wakayama Prefecture) and its main temple Kongōbuji 金剛峯寺. Niu Myōjin and Kariba Myōjin are the two main guardians (Chinju 鎮守) of the Mt. Kōya monastery. The other two were added later to create a grouping of four known as the Kōya Shisho Gongen 高野四所権現 or Kōya Shisha Myōjin 高野四社明神. The four are venerated at Amano Jinja 天野神社 (aka Niutsuhime Jinja 丹生都比売神社). Kehi Myōjin 気比明神; deity from Fukui Prefecture added later in Kamakura era to create grouping of four; Shinto counterpart is Oogetsu-hime no Ookami 大食都比売大神. Miyajima Myōjin 厳島明神; deity from Hiroshima Prefecture added later in Kamakura era to create grouping of four; Shinto counterpart = Ichikishima-hime no Ookami 市杵島比売大神. Kūkai (at top center), along with the two tutelary deities of the Mt. Kōya monastery (Kariba Myōjin at left and his mother Niu Myōjin at right). The three serve as the main objects of worship in a scroll used for the Question-and-Answer Ceremony. Most pieces date to the Kamakura period. Most come from Kongōbuji Temple at Mt. Kōya. Niu Myōjin is the mother mountain deity of Mt. Kōya, and gave permission to Kūkai to build the Kongōbuji Temple. Kariba, her son, is also known as Kōya Myōjin. He appeared to Kūkai as a hunter and then led Kūkai to the site where Kongōbuji Temple was built. In artwork, Niu Myōjin typically has the Siddham seed syllable (bonji) AAKU アーク written above her. Kariba typically has the seed syllable BAN written above him. Both are seed syllables for Dainichi Nyorai. AAKU symbolizes the Womb World and BAN the Daimond World. 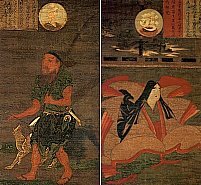 In artwork, Kariba is traditionally depicted with two dogs, for in the myths surrounding the creation of Kongōbuji Temple, Kariba appeared as a hunter with two dogs, one black, one white. Kue Mandala 九会曼荼羅. Also spelled Ku-e. Main form of the Kongōkai Mandala used by Shingon sect. The Tendai sect, however, sometimes uses the Kongōkai Hachijūisson Mandala 金剛界八十一尊曼荼羅 instead. The central deity is typically Kongōsatta 金剛薩た. 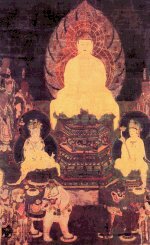 The disposition of the deities is identical to that of the Aizen Mandala, but in the latter the central deity is Aizen, not Kongōsatta. Kūkai 空海 (774 - 835 AD). Also spelled Kukai, Kuukai. Founder of Japan's Shingon 真言 sect of Esoteric Buddhism (Jp. = Mikkyō 密教) His posthumous name is Kōbō Daishi 弘法大師 (Kobo Daishi). The flowering of mandala artwork in Japan is credited primarily to Kūkai and the Shingon sect rather than to Saichō 最澄 (767 - 822 AD) and the Tendai sect. For more details on Kūkai, see Shingon below or visit the Esoteric Buddhism page. Ink, color, and gold on silk. One of three extant narrative scrolls. Lotus Mandala. See Hokke (Hoke) Mandala. and depicted Miroku in Tusita Heaven. Shiga Prefecture, Important Prefectural Property, Color on Silk; no date given at below site. Miroku Mandala 弥勒曼荼羅 or Miroku Bosatsu Mandara 弥勒菩薩曼荼羅. Classified as a Besson Mandala, one featuring a single deity from the Bodhisattva Family, in this case Miroku 弥勒, the Future Buddha. Extant examples of this mandala from the Kamakura period are preserved at Daigoji Temple 醍醐寺 (Kyoto) and at Reiunji Temple霊雲寺 (Tokyo). In Esoteric Buddhism, Miroku appears in the Eight-Petal Court of the Taizōkai Mandala, and in the Kongōkai Mandala as one of the 16 Deities of the Auspicious Aeon (Gengō Jūrokuson 賢劫十六尊). A 30-armed form of Miroku is also mentioned in iconographic texts, but no statuary or mandala of this type exists. Miroku also appears in the Tosotsuten Mandala 兜率天曼荼羅 depecting Miroku’s Tusita Heaven (one is preserved at Enmeiji 延命寺 in Osaka), as well as in paintings known as the Miroku Raigō-zu 弥勒来迎図 (one is preserved at Shōmyōji Temple 称名寺 in Kanagawa prefecture). The latter show Miroku’s descent to earth to bring devotees back to Miroku’s Pure Land. Miroku is one of the Thirteen Buddha (Jūsanbutsu 十三仏). In this role, Miroku presides over the memorial service on the 42nd day after one’s death. Miya Mandala 宮曼荼羅. Literally Shrine Mandala. 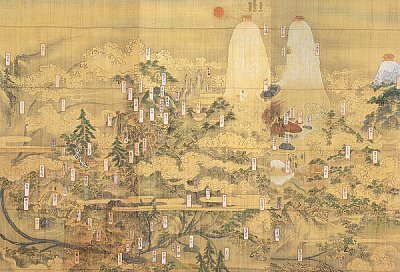 A painting that depicts a shrine, its landscape, the arrangement of its salient buildings, and other noteworthy features. Similar in many ways to a tourist map. See Ise Mandala, Kasuga Mandala, Kumano Mandala, and Hakusan Mandala. Miya Mandala do not depict the Shintō (Shinto) kami in human form. One of four major mandala categories in Japan. See Quick Quide. Myōken Mandala 妙見曼荼羅. Classified as a Besson Mandala, one featuring a single deity from the Celestial Gods Family, in this case Myōken (Myoken) 妙見. Also considered a Hoshi (Star) Mandala. Myōken (Skt. = Sudrsti) is also known in Japan as Sonshō-ō 尊星王, Myōken Son 妙見尊, Hokushin北辰, Hokushin Bosatsu 北辰菩薩, and Hokuto Myōken Bosatsu 北斗妙見菩薩. Belief in Myōken reportedly began in Japan in the 9th century after his/her attributes were described in the Nihon Ryōiki 日本霊異記 (alternate readings include Nihon Rei-iki or Nippon Reiiki). The text's full title is Nihonkoku Genpō Zen'aku Ryōiki 日本国現報善悪霊異記, which is commonly translated as "Miraculous Stories of Karmic Retribution of Good and Evil in Japan.” S/he was originally considered a deification of the Polestar (Hokushin 北辰), but because of confusion between the Polestar and the Big Dipper, s/he also became associated with the Big Dipper (Hokuto 北斗). See Hokuto Mandala. S/he is popularly regarded as a Bodhisattva (hence her name Myōken Bosatsu 妙見菩薩), but this is wrong. She should more properly be classied as one of the Ten 天 (Skt. = Deva), and categorized into the Celestial Gods Family. Among followers of the Jimon 寺門 branch of the Tendai 天台 sect, she is equated with Kichijōten 吉祥天, and is invoked for apotropaic functions and for healing eye diseases. She was partially adopted in the Shintō pantheon, where she is known as Myōkenjin (Myokenjin) 妙見神 and shown with a halo depicting the seven stars of the Big Dipper and holding a sword. The Nichiren 日蓮 sect also includes her as one of its deities, and even today she remains a relatively popular divinity. Artwork of Myōken exhibits much diversity. The term Myōken 妙見 literally means "heavenly eyes" or "heavenly sight," or "one who sees all." 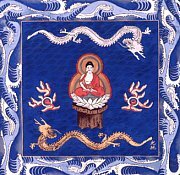 His/her attributes are not firmly set, but in Japan the deity often appears with two arms or four arms, is shown seated on a cloud or standing atop a dragon or turtle. For numerous photos, please see the Myōken Page. 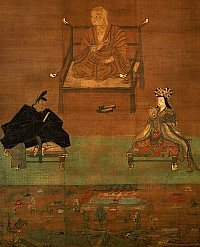 Nichiren 日蓮 (1222-82). See Hokke Mandala above. Used in rites of pacification. Nyoirin Mandala 如意輪曼荼羅. 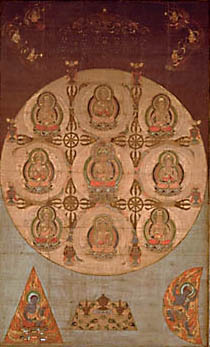 Classified as a Besson Mandala, one featuring a single deity from the Kannon Family, in this case Nyoirin Kannon 如意輪観音, the omnipotent form of Kannon Bodhisattva. This mandala comes in various manifestations. Often the diety is shown with six arms and holding a wish-granting jewel. Some show Nyoirin on a rock (which represents Kannon's paradise) rising from the sea. Despite differing opinions about Nyoirin’s meaning, it is generally believed s/he offers people what they want in this world or in the monastic life. The jewel s/he holds represents wisdom, the Buddha-nature, aspiration to enlightenment, and wealth. The wheel s/he holds represents the Dharma (the Buddhist teachings). The wheel’s eight spokes represent the eightfold path to enlightenment taught by Shaka Nyorai 釈迦如来 (the Historical Buddha). Nyoirin's six arms represent the Six Realms (Rokudō 六道) of karma and rebirth. 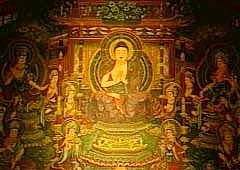 Nyoirin Kannon sometimes appears in a golden color in the Rengebu-in section 蓮華部院 (Lotus Court section; aka Kannon-in section 観音院) of the Taizokai Mandala. Another mandala form is the Shichishō Nyoirin Mandala 七星如意輪曼荼羅, a type of Hoshi (Star) Mandala. It can be translated literally as the Seven-Star Nyoirin Mandala (other spellings: Shichisho, Shichishou). Ryōbu (Ryobu) Mandala 両部曼荼羅. Mandala of the Two Realms (Worlds). See Ryōkai Mandala. The term Ryōbu is generally attributed to the Shingon Sect, and refers to schemes whereby Shinto deities are given Buddhist counterparts. The Shingon doctrines associate the Inner Shrine of Ise (see Ise Mandala) with the Womb Realm (Taizōkai), and the Outer Shrine with the Vajra Realm (Kongōkai). The central deity in both realms is Dainichi Buddha 大日如来. Ryōkai Mandala 両界曼荼羅 (also written Ryokai or Ryogai). Mandala of the Two Realms, or Mandala of the Two Worlds. Composed of the Taizōkai (Taizokai) and Kongōkai (Kongokai) mandalas. The two represent a unified pair, and are customarily hung facing each other in temple halls, the Taizōkai on the east side and Kongōkai on the west. Orthodox versions were introduced from China to Japan by Kūkai 空海 (Kukai, Kuukai; 774-835), and numerous copies and variations made from them. The pair depicts the myriad deities in the Buddhist pantheon. This two-mandala format underpins the teaching of Esoteric Buddhism in Japan. Says JAANUS: “The term Ryōkai Mandara is thought to have been first used by Godaiin Annen 五大院安然 (841-889～898) of the Tendai 天台 sect. Because of its associations with the Tendai Sect, there are even today many Shingon 真言scholars who instead prefer the term Ryōbu Mandala, or "Mandala of the Two Divisions." However, the term " Ryōkai Mandara" is the term used by modern art historians, and also used by Japanese authorities to designate national treasures and important cultural properties. 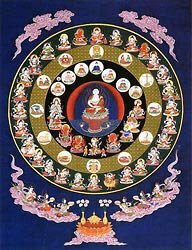 There are minor differences in the disposition of the deities.” <end JAANUS quote> For more details, see Mandala Quick Guide. Saichō 最澄 (767 - 822 AD). Also spelled Saicho. Founder of Japan's Tendai 天台 sect of Esoteric Buddhism (Jp. = Mikkyō 密教). His posthumous name is Dengyō Daishi 伝教大師 (Great Master Who Transmitted the Teachings). Despite his many contributions, the flowering of mandala artwork in Japan is generally credited to Kūkai (aka Kōbō Daishi) and Shingon traditions. See Esoteric Buddhism for a few more details on Saichō. Sangatsu-kyō Mandala 三月経曼荼羅. Also Sangatsukyo Mandala. 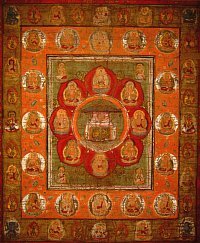 Devoted to Shaka Nyorai, the Historical Buddha, and therefore classified as a Besson Mandala. Depicts the Shaka Triad, with Shaka seated in the center and surrounded by Monju Bodhisattva (often atop lion) and Fugen Bodhisattva (often atop white elephant). Monju symbolizes wisdom, while Fugen symbolizes meditation and practice. The 16 Protectors of Shaka (Shaka Jūroku Zenshin 釈迦十六善神) often appear as well. Shana-in Temple 舎那院, Shiga Pref. Sanjūshichisonyō (Sanjushichisonyo) 三十七尊様. Depicts the deities of the Kongōkai Mandala. It was first introduced from China to Japan in 805 by Saichō 最澄 (766-822), the founder of Japan’s Tendai 天台 sect, who also introduced the Daibutchō Tsūyō Mandala, a variety of Besson Mandala. Despite Saichō's many contributions to Buddhist faith and art in Japan, the flowering of Japanese mandala artwork is credited primarily to Kūkai and the Shingon sect. Sankei Mandala 参詣曼荼羅. Pilgrimage paintings that depict a specific shrine (or temple), its environs, landscapes, and pilgrims attending to their religious duties. It is a broad category, and includes such mandala as the Ise Mandala, Kasuga Mandala, Fuji Mandala, Kumano Mandala, and others. Unlike Miya Mandala, which are often static representations of a shrine layout, Sankei Mandara tend to present a dynamic aspect, one that describes the activities undertaken by shrine (or temple) visitors, and thus sankei paintings are commonly filled with figures of people moving through the sacred space. One of four major mandala categories in Japan. See Quick Quide. Shaji Mandala 社寺曼荼羅. See Kasuga Mandala. Includes images of both Kasuga Shrine and Kōfukuji Temple. Shaka Mandala 釈迦曼荼羅. A mandala devoted to Shaka Nyorai 釈迦如来, the Historical Buddha, and therefore classified as a Besson Mandala. Other mandala centered on Shaka include the Bodaijō Manadala 菩提場曼荼羅, Hokke Mandala 法華曼荼羅, Hōrōkaku Mandala 宝楼閣曼荼羅, Sangatsu-kyō Mandala 三月経曼荼羅, and Shōugyō Mandala 請雨経曼荼羅. Shaka also appears in the center of the Shaka-in 釈迦院 section of the Taizōkai Mandala (with hands forming the tenbōrin-in "teaching" mudra). In the Kongōkai Mandala, Shaka appears in the form of Tenku Raion 天鼓雷音 (Skt. Divyadundubhimeghanir ghosa) in the Henchi-in section 遍知院 and as Fukūjōju 不空成就 among the Five Wisdom Tathagata (Gochi Nyorai 五智如来). Shichishō Nyoirin Mandala, Shichisho Nyoirin Mandala, 七星如意輪曼荼羅. Seven-Star Nyoirin Mandala. Classified as a Hoshi Mandala. Centered on Nyoirin Kannon如意輪観音. See Nyoirin Mandala. Shika Mandalaa 鹿曼荼羅 (literally Deer Mandala). See Kasuga Mandala. Shiki Mandala 敷曼荼羅. Mandala for Laying Out. A scroll-like painting that can be spread out like a carpet. It is used during Esoteric initiation rites (Kanjō, Kanjo, Kanjou 潅頂; Skt. = Abhiseka), during which it is spread out on top of an altar. Originally, in India, where the initiation tradition is no longer practiced, the mandala was drawn with powdered pigment or colored sand, and then destroyed after only one use. The Shiki Mandara was probably devised in China as a substitute for these earlier forms. In Japan’s initiation rites, the initiand casts a flower that falls on one of the many deities shown on the mandala – that deity thereafter becomes his/her tutelary deity. For obvious reasons, few Shiki mandala are extant. The oldest known version is one preserved at Tōji (Toji) Temple 東寺 in Kyoto (dated 1112). Deities in this mandala are depicted facing the center (as are counterparts in Tibet and Nepal). There are also many examples of Shiki Mandara that assume the form of a Shuji Mandala (which depict the deities with Sanskrit syllables) or Sanmaya Mandala (which depict the deities with symbolic objects). A 16th-century example of the latter is preserved at Tōji Temple 東寺 in Kyoto. Some scholars suggest that Shuji and Sanmaya forms were used widely in Japan because it is more difficult to distinguish the deities in the human forms they assume on the Shiki Mandala. Shingon 真言 Sect. Scholar-monk Kūkai 空海 (774 - 835 AD) founded Japan's Shingon 真言 sect. Like the Tendai 天台 sect founded by Kūkai's contemporary Saichō 最澄 (767 - 822), the Shingon school of Esoteric Buddhism (Jp. = Mikkyō 密教) originated in China. Kūkai traveled there on the same fleet of ships that carried Saichō, but the two did not meet apparently. Kūkai returned to Japan in 806 with numerous text, relics, and mandala artwork to spread the Shingon teachings. Indeed, the flowering of mandala artwork in Japan is credited primarily to Kūkai and his Shingon sect rather than to Saichō and the Tendai sect. The Japanese Shingon sect, in contrast to the multi-school Tendai sect, was predominantly Esoteric. Its doctrines were mystical and occult, and required a high level of austerity. Elaborate and secret rituals (utilizing mantras, mudras, and mandalas) were developed to help practitioners achieve enlightenment. Despite its complex practices, Shingon exerted a profound impact on religious art and the faith of the court and monastic orders. Kūkai is credited with introducing Japan to the so-called Konpon Mandala 根本曼荼羅, literally the "root mandala." This is the name given to the first images of the two mandala (Ryōkai Mandala) brought back from China to Japan by Kūkai (774 - 835 AD). The Shingon mandala lineage based on these "root" mandala is known as the "Genzu" or "original image" mandala. See Genzu Mandala. 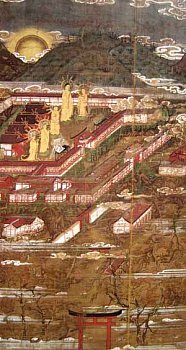 Kūkai returned from China in 806, and by 816 obtained imperial sanction to construct his monastery complex on Mt. Kōya 高野, a serene location on the Kii peninsula still considered a Holy Land and one of modern Japan's most popular pilgrimage sites. Both Kūkai and Saichō received the precepts at Tōdaiji 東大寺, Saichō around 786 and Kūkai in 795. Today Kūkai remains one of Japan's most beloved Buddhist figures, and portraits of him abound, but his legend is riddled with folklore. He played an active role in many fields, it is said, performing rituals for the emperor, constructing a large reservoir in Shikoku for the common people, and establishing the first school for common citizens. He is credited with inventing Japan's kana script. He is also one of Japan's most celebrated calligraphers, and supposedly published Japan's first dictionary. He became a major patron of the arts, and reportedly founded hundreds of temples across Japan. The popular “Shikoku Pilgrimage to 88 Sites” is attributed to Kūkai. Many of the photos presented on this page come from Shingon temples associated with Mt. Kōya 高野. Shishu Mandala 四種曼荼羅. Also known as Daimandara 大曼荼羅. One of four basic artistic/stylistic mandala cateogories, one depicting the deities in pysical (human) form. See also Sanmaya Mandala (symbolic objects), Katsuma Mandala (three-dimensional images), and Shuji Mandala (Sanskrit symbols). 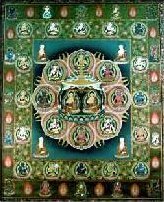 The Shishu Mandala is also sometimes used in Esoteric initiation rites, wherein it is considered a type of Shiki Mandala. 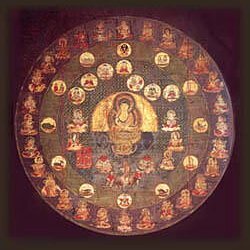 But identifying the deities in this mandala (depicted in human form) is more difficult than identifying symbolic objects or Sanskrit symbols, and thus the Shishu Manadara was not always preferred in Japan’s Esoteric initiation rites. Modern Rendition by Japanese mandala artist KOJUN. Shōugyō Mandala (Shougyo Mandala), 請雨経曼荼羅. Mandala to Pray for Rain. Also known as the Shōuhō Mandala, Shouho Mandara, 請雨法曼荼羅. Mandala Ritual to Pray for Rain. 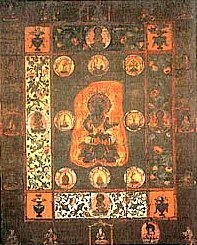 Classified as a Besson Mandala featuring the Sutra-Rite family of deities. Based on the ritual text Daiungyō (Daiungyo) Kiu Dampō (Dampo) 大雲経祈雨壇法, which was used in ceremonies to pray for rain. It is related to the Daiunrin Shō-u-gyō Sutra 大雲輪請雨経 (Skt. = Makhamegha Sutra), also abbrreviated as Shōgyō (Shogyo). The mandala shows Shaka 釈迦如来 (Historical Buddha) seated inside a central pavilion, which represents the Palace of the Dragon Sea King, flanked on the left by Kongōshu 金剛手 (Kongoshu, Skt. = Vajrapani) and right by Kannon 観音 (or Rengeshu 蓮華手, Skt. = Padmapani), and in the foreground are shown the three dragon kings. The triad of Shaka, Kannon, and Kongōshu dates back to Mathura (India), and evolved later into the three families (or divisions) known as the Buddha Family (Butsu-bu 仏部), Lotus Family (Renge-bu 蓮華部), and Adamantine or Diamond Family (Kongō-bu 金剛部). There are various extant representations of this mandala, but the disposition of deities varies, and sometimes the triad is omitted entirely, with only the dragon kings appearing. Above mandala is actually a Hokke Mandala (Lotus Mandala), one using Sanskrit syllables to represent the deities. Shuji Mandala 種字曼荼羅. Also called the Hō (Ho, Hou) Mandara法曼荼羅. One of four basic artistic/stylistic mandala cateogories, one wherein deities are represented by Sanskrit syllables. See also Sanmaya Mandala (symbolic objects), Katsuma Mandala (three-dimensional images), and Shishu Mandala (human form). Shūnanzan (Shunanzan) Mandala 終南山曼荼羅. Reflects Taoist influences. Classified as a Star Mandala (Hoshi Mandala). Songyō (Songyo) Mandala 尊形曼荼羅. Mandala of Worship. Also known as Honji Suijaku Mandala (Mandala of True and Manifest Deities). The latter depicts Shintō (Shinto) deities (Kami 神) as manifestations (Suijaku 垂迹) of their Buddhist counterparts (Honjibutsu 本地仏), and are meant to represent Shinto-Buddhist unity. See Kasuga Mandala for clarification. The former is a type of Suijakuga 垂迹画 (paintings based on theories of Buddhist/Shinto unity). The art form is devotional (usually a large hanging scroll) showing shrine deities in human form. The deities are dressed in either their Shintō or Buddhist attire and arranged in geometric composition. There are many types of mandala that represent the unity of Buddhist and Shinto deities. See Suijaku Mandala for a larger list of such mandala. Sonshō (Sonsho) Mandala 尊勝曼荼羅. Classified as a Besson Mandala, one devoted to a single deity in the Buddha Crown Family. It evolved from a cult centered around Butchō Sonshō Darani 仏頂尊勝陀羅尼 (Butcho Soncho Darani , Skt. = Usnisavijaya-dharan; Taisho No. 967). It is used in the Sonshō Rite (Sonshōhō, Shonshoho 尊勝法), which is performed for longevity and the absolution of sins. In Japan, many pieces are extant. There are three main types: (1) Dainichi 大日 depicted in center surrounded by Eight Great Butchō 仏頂 (Buddha-Crown), along with Fudō (Fudo) 不動 inside a triangle symbolizing fire and Gōzanze (Gozanze) 降三世 inside a semicircle symbolizing wind that are shown in the lower left and lower right portions. 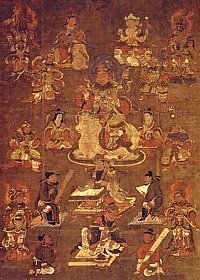 (2) Dainichi surrounded by Eight Bodhisattva as listed in the Hachi Daibosatsu Mandara Kyō 八大菩薩曼荼羅経 or the Sutra of the Mandala of the Eight Great Bodhisattva, Taisho No. 1167 (but only line drawings of this type are still extant). (3) Omits the eight deities altogether and consists of a triad composed of Dainichi, Fudō and Gōzanze. A famous extant three-dimensional example of this mandala is preserved at Kongōji (Kongoji) Temple 金剛寺 in Osaka. Star Mandala. See Hoshi Mandala 星曼荼羅 above; also see Hokuto Mandala. Numerous photo as well under those two entries. Suijaku Mandala 垂迹曼荼羅. Associated with Shintō (Shinto) deities and their Buddhist counterparts. Also known as the Sujiakugyō (Suijiakugyo) Mandara 垂迹形曼荼羅 or Suijakushin Mandara 垂迹神曼荼羅. In such mandala, the Shintō deities (kami 神) are represented as Japanese courtiers, Buddhist monks (aka Sōgyō Hachiman 僧形八幡), young boys (Dōji, Doji, Douji 童子), or Chinese ladies. Another variation is the Honji Mandala 本地曼荼羅 (or Honjibutsu Mandala 本地仏曼荼羅), wherein the Shintō kami are represented by their Buddhist counterparts (Honjibutsu本地仏). Another version is the Honjaku Mandala 本迹曼荼羅, an abbreviation of Honji Suijaku Mandala 本地垂迹曼荼羅. In the latter, the kami are represented in their manifest Shinto form (Suijaku 垂迹) and in their true Buddhist form (Honjibutsu 本地仏). See Kasuga Mandala and Hie Sanno Mandala for more details and photos. Tairaku Mandala 大楽曼荼羅. Mandala of Great Bliss. See Rishukyō Mandala. Taizōkai (Taizokai, Taizoukai) Mandala 胎蔵曼荼羅. Womb World Mandala or Matrix Mandara. It is one of the most popular mandala forms among Japan's Esoteric sects. Paired with the Kongōkai Mandala, it is known as the Ryōkai Mandala (or Mandala of the Two Realms/Worlds). Both are typically hung in the halls of Esoteric temples, one on the east side and the other on the west. The Taizōkai Mandara is referred to as the Mandala of Principle (Ri Mandara 理曼荼羅) or Mandala of Cause (In Mandara 因曼荼羅). Taizōkai is the abbreviated form of Daihitaizōshō (Daihitaizosho) Mandara大悲胎蔵生曼荼羅 (Mandala Born of the Womb of Great Compassion), and this abbreviated term was used commonly instead of its longer parent from the 8th century onward in Japan. The Taizōkai is described in the Dainichikyō (Dainichikyo) Sutra大日経 (Skt. = Vairocanabhisambodhi Sutra, also known as the Mahavairocana Sutra). Its precursors were the Taizō Zuzō (Taizo Zuzo) and Taizō Kyūzuyō (Taizo Kyuzuyo). One of the most popular versions of the Taizōkai, still widely used today, is the Genzu Mandala. Taizō Kyūzuyō (Taizo Kyuzuyo) 胎蔵旧図様. A primitive early form of the Taizōkai Mandala; iconographical line drawings in handscroll form that predate the Genzu Mandala; an extant copy dated to 1193 is in the Mutō collection; it depicts 242 deities. Taizō Zuzō (Taizo Zuzo) 胎蔵図像. A primitive early form of the Taizōkai Mandala; iconographical line drawings in handscroll form that predate the Genzu Mandala. Extant reproductions dated to 1194 and 1274 depict 324 deities. These reproductions are preserved at the Nara National Museum. Takao Mandara 高雄曼荼羅 at Jingoji Temple 神護寺 in Kyoto. Considered a famous example of the Ryōkai Mandala and a designated national treasure. One of the mandala brought back from China to Japan by Priest Kūkai (774 - 835 AD), from which other copies (with variations) were made. Tateyama Mandala 立山曼荼羅. Closely associated with the Pure Land (Jōdo, Jodo 浄土) sects devoted to Amida Buddha. Tateyama is a mountainous region in the eastern part of Japan's Etchu area (present day Toyama Prefecture), and has long been considered a sacred mountain. In the Edo Period, proselytizing warrior monks carried Tateyama mandala images across all of Japan, using them as pictorial teaching materials. Amida and 25 Welcoming Bodhissattva (including Kannon and Seishi) are shown welcoming believers into Amida’s Western Paradise. Other celestial beings appear as well in the pictorial paradise above the Tateyama range (the range represents Amida’s Western Paradise). The lower section depicts various scenes of hell, such as a blood pool, a limbo for children, and a fiery chariot. Tendai 天台. Scholar-monk Saichō 最澄 (767 - 822) founded Japan's Tendai sect. The Tendai school originated in China, where Saichō (Saicho) had traveled to study the teachings (in the same fleet of ships that also carried his famous colleague Kūkai 空海). Saichō returned to Japan in 805 with numerous text, relics, and artwork to spread the Tendai teachings and soon thereafter established the Tendai Sect under the imperial sanction of Emperor Kanmu 桓武 (737–806). Saichō is credited with introducing the Sanjūshichisonyō (Sanjushichisonyo) 三十七尊様, a painting which he brought back from China. It is a type of Kongōkai Mandala depicting 37 deities. Saichō also introduced the Daibutchō Tsūyō Mandala, a variety of Besson Mandala. Once transplanted to Japanese soil, Tendai teachings flowered. Saichō's sect attempted a synthesis of various Buddhist doctrines, including faith in the Lotus Sutra, Esoteric rituals, Amida (Pure Land) worship, and Zen concepts. Tendai gained great court favor, rising to eminence in the late Heian era. The Tendai shrine-temple multiplex (then and now) is located at the foot of Mt. Hiei 比叡 in Shiga Prefecture. The shrine stronghold is known as Hie Sannōsha 日吉山王社 (also called Hiyoshi Sannōsha), while the Buddhist stronghold is known as Enryakuji Temple 延暦寺. Despite Saichō's many contributions, the flowering of mandala artwork in Japan is credited primarily to Kūkai and his Shingon sect. Saichō received the full precepts at the age of 19 (around 786) at Tōdaiji 東大寺, the same place as his famous contemporary Kūkai, who received the precepts in 795. See Hie Sannō Mandala for more details and photo. See Esoteric Buddhism for more details. Tenkawa Benzaiten Mandala 天川弁才天曼荼羅. Tenkawa Jinja Shrine 天河神社 in Nara Prefecture is a sacred site and practice location for Shugendō 修験道 devotees. Shugendō is a syncretic sect that combines Taoist magic, Shinto beliefs, and Estoteric doctrines. Tenkawa Jinja is also devoted to the Goddess Benzaiten, and hence is also called Tenkawa Dai-Benzaitensha. The Tenkawa Benzaiten Mandala (shown below) was used to invoke her aid for bountiful harvests and good fortune. Nōman-in Temple 能満院 in Sakurai City 桜井市, Nara Pref. At the top of the mandala are three sacred gems (hōju 宝珠) with flame nimbus (kaenkō 火焔光) shown atop three mountains. At the center of the mandala is a 10-armed Benzaiten shown in human form but with three serpent heads. Around her are the Jūgo Dōji 十五童子 (Fifteen Sons or Disciples of Benzaiten), all holding various symbolic objects. Strewn everywhere throughout the painting are images of the Hōju 宝珠 (Sacred Gem), which represent the power to expel evil, cleanse corruption, remove suffering, and grant every wish. In some esoteric traditions in Japan, this sacred jewel is said to have emerged from the head of the dragon king (Ryū-ō 竜王; dragons are a type of serpent). The snake-headed Benzaiten represents the syncretic Shinto-Buddhist deity known as Ugajin 宇賀神 or Uga Benzaiten. The foxes and male-female pairs inside the painting symbolize the merging of Oinari 稲荷 (also written Inari; he is the Japanese god of rice, his messenger is the fox) with the esoteric deity known as Dakiniten 荼吉尼天, a Hindu goddess adopted into the Buddhist pantheon. Her messenger is a white fox. Another similar piece is kept at Ishiyama-dera 石山寺, a Shingon temple in Otsu City (Shiga Pref.). Such syncretic pieces are relatively rare in Japan. Tobu Mandala 都部曼荼羅. See Toe Mandala. Toe Mandala 都会曼荼羅. Also called the Tobu Mandara 都部曼荼羅. A mandala form depicting myriad deities from all "divisions" or "families" (Jp. = Bu 部) in the Buddhist pantheon. The most widely known type of Toe Mandala in Japan is called the Ryōkai Mandala, commonly rendered in English as the Mandala of the Two Worlds. One of four major mandala categories in Japan. See Quick Quide. Tōhon (Tohon) Hokuto Mandala 唐本北斗曼荼羅. Of Chinese origin and devoted to Shijōkō Butchō (Shijoko Butcho) 熾盛光仏頂. Classified as a type of Hoshi (Star) Mandala. 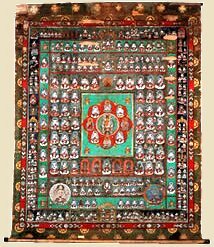 Also see Daibutchō Mandala for descriptions of numerous Butchō deities. Tosotsuten Mandala 兜率天曼荼羅. Appeared in the Kamakura period; depicted Miroku in Tusita Heaven. See Miroku Mandala for details and photo. Panel, ink, color, and gold on silk. Yoshino Mandala 吉野曼茶羅. Devotional paintings of the deities, the shrines, and the landscapes of the Yoshino 吉野 area, located in the Ōmine (Oomine) 大峰 mountains near Nara. Such mandala are sometimes devoted to the syncretic Shintō-Buddhist deity Zaō (Zao) Gongen 蔵王権現 (Avatar Zaō) surrounded by deities from the eight other shrines in the area. Relatively few Yoshino Mandala are extant, but they appeared frequently in the Muromachi and Edo periods, when the ascetic practises of the Shugendō (Shugendo) 修験道 sect were still widespread. Zaō is one of the most important deities of the syncretic Shugendō sects, a diverse tradition of mountain ascetic traditions associated with Shinto beliefs, Taoism, magic, supernatural powers, and Esoteric (Tantric) Buddhism. 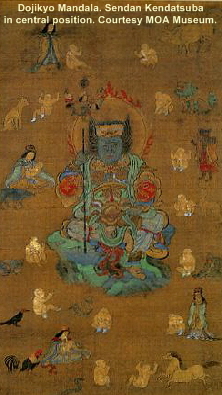 Zao serves as the protector deity of sacred Mt. Kimpusen (Mt. Kinpu) 金峰山 in Japan's Nara prefecture and is considered the local Japanese Shinto manifestation (avatar = gongen) of three Buddhist divinities -- the Historical Buddha (past), Kannon Bodhisattva (present), and Miroku Buddha (future). Kimpusenji Temple is the head temple of Japan’s Shugendō sect even today.The mountains of the Yoshino area are centers of the Shugendō tradition, which traces its origins back to the 7th century and the wandering holy man En no Gyōja 役行者 (En no Gyoja), who had prayed for a powerful deity to assist him. After various visions, the deity Zaō finally appeared and henceforth became the sect’s tutelary deity. In the all-important Ryōkai Mandala (a pair of mandala known as the Taizōkai and Kongōkai), Shugendō adepts are represented travelling through the mountains between Yoshino and Kumano (see Kumano Mandala). By the late Heian period, Yoshino became a major pilgrimage site for the court and commoner alike, and was mentioned often in poetry and literature from the 10th century onward. It served for a short time as the capital of Emperor Godaigo 後醍醐 (r.1318-1339), and is even today very famous for its scenic beauty and cherry blossoms. The latter, according to legend, were planted in the 7th century by En no Gyōja 役行者 and dedicated to the area’s tutelary deity, Zaō Gongen. A rare Yoshino Mandara devoted to Zaō is owned by Nyoirinji Temple 如意輪寺 at Mt. Yoshino. Butsuzō-zu-i 仏像図彙, the “Collected Illustrations of Buddhist Images.” Published in 1783 AD. One of Japan’s first major studies of Buddhist iconography. Hundreds of pages and drawings, with deities classified into approximately 80 (eighty) categories. Modern-day reprints of the expanded Meiji-period version are available at this online store (J-site). Mandara Zuten 曼荼羅図典 (Japanese Edition). The Mandala Dictionary. 422 pages. First published in 1993. Publisher Daihorinkaku 大法輪閣. Language Japanese. ISBN-10: 480461102-9. Available at Amazon. A Dictionary of Chinese Buddhist Terms. With Sanskrit & English Equivalents. Plus Sanskrit-Pali Index. By William Edward Soothill & Lewis Hodous. Hardcover, 530 pages. Published by Munshirm Manoharlal. Reprinted March 31, 2005. ISBN 8121511453.